ALERT! ALERT! ALERT! 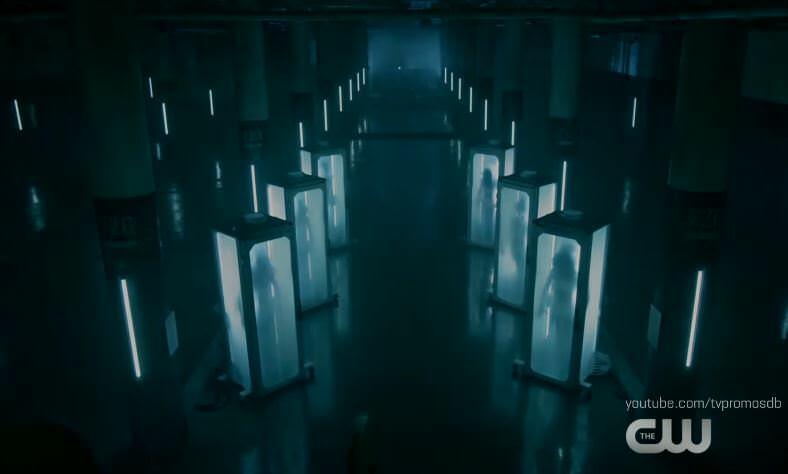 Frozen babes in stasis tubes on tonight's Black Lightning episode! "Sins of the Father: The Book of Redemption" Someone is exploiting the poorer communities of Freeland by flooding the streets with a highly addictive drug called green light (which was originally given as a vaccine meant to induce docility). A street level drug dealer gives a female high school student (Neema) a bootlegged product. She has a bad reaction to the drug and is immediately abducted off the street by thugs in a white van. 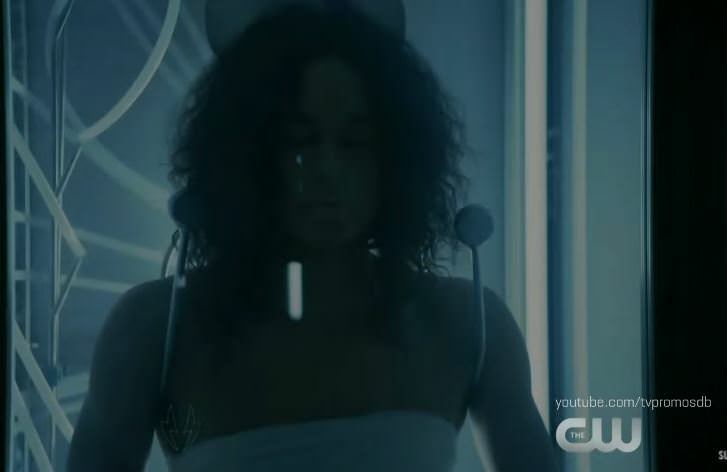 Anissa breaks into a lab where bodies are being stored and kept alive in suspended animation. 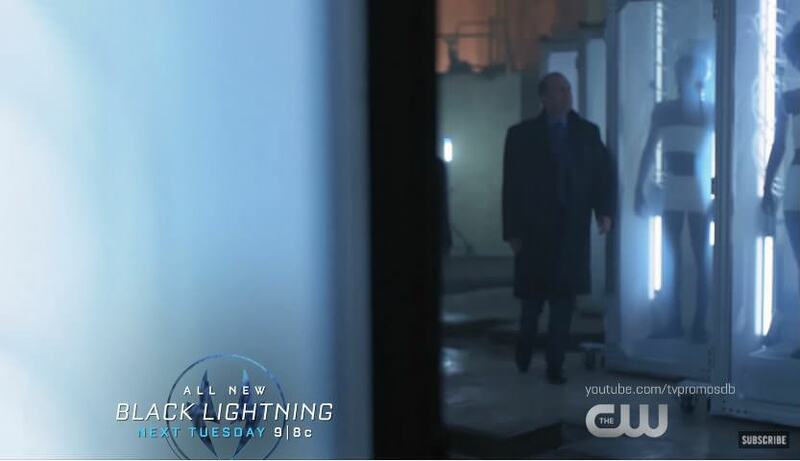 She leaves the facility for back up, but when she returns w/ Black Lightning, the facility has been cleared of any evidence. It is believed that the bodies were those of students that have gone missing from the surrounding black community. First scene set up starts at 1:36. 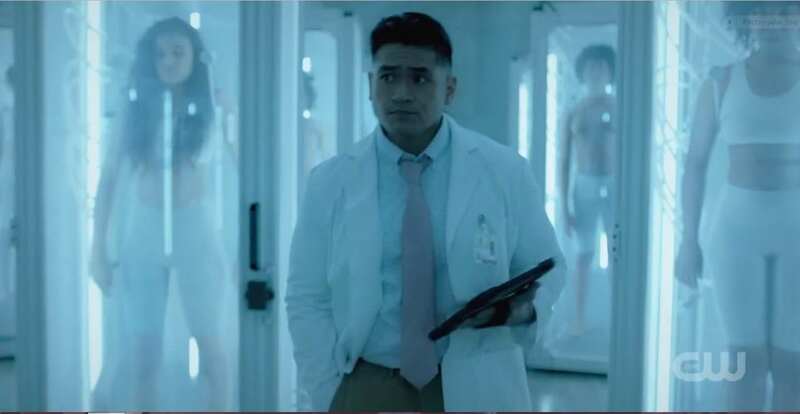 Scene two: It is suggested that the abductors have an inside source or "spotter" who can provide information on who to kidnap for their secret green light experiments. Proctor (with the ASA) is seen walking along and examining the stasis pods (now at a new location). A woman appears beside him as they look in on the stasis pod that now contains Neema (the female abducted in the scene above). He thanks her for her help with the "new acquisition" revealing that Kara Fowdy (the vice-principal at Garfield High) is in fact his inside connection. Proctor asks Fowdy if she knows of any more students with special abilities, she replies "No, not yet." He then advises, "Keep your eyes open; I'm sure more will show up" which (hopefully) foreshadows that one of Black Lightnings daughters may be a future target. If anybody has figured out what down loader to use to burn HD episodes off The CW onto a hard drive, please post (or even message me on here). ...And thanks for all the help. I was on a mission to get it. And you're welcome.